Making websites and PDF documents accessible to the blind begins with a screen reader, a software program that converts text displayed on a computer into words the blind can hear. The problem is that we rarely read a website left to right and top to bottom. We scan across sections and click on links to other pages. The blind can't do that. Their screen readers need clues embedded in a website's HTML to tell the blind listener how a web page is laid out. Sometimes it's just the 20-second task of using an alt attribute attached to an image tag to describe an image. The blind hear that image description, while sighted folks don't know or care about alt attributes. Making such accessibility changes usually leaves the website looking the same to sighted folks, but the hidden changes make all the difference in the world to blind folks. So if the needed changes don't bother anyone and are quick to implement, why don't webmasters just make the changes? The reason is that webmasters are too busy designing and managing websites to read 100-page accessibility standards like WCAG 2.1 which can be complex to understand. That is where Access2online comes in. 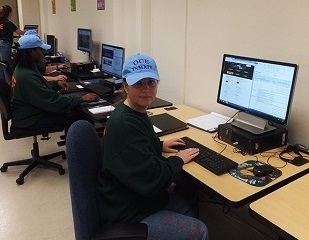 Our Coordinator begins by making an offline copy of the customer's web pages for our inmates to work on. This is not a screenshot image; it contains all the native HTML. Access2online workers then analyze a customer's web page(s) with software tools that identify violations of Section 508 of the federal Rehabilitation Act or the WCAG 2.1 accessibility standard. These tools make sure we don't miss anything, but they often don't say what needs to be done to fix the problem. Our experienced analysts know how to do that. A missing alt attribute, for example, would trigger a non-compliance item, but our analyst would look over the image and provide the words for the alt attribute that would be most useful for the blind. The Access2online analyst compiles a recommendation report one non-compliance item at a time. This report forms a to-do list for your webmaster. The analyst identifies the location of each item, says a few words about the violated citation in the Section 508 regulation or the WCAG 2.1 accessibility standard, and details the exact remediation recommended. Once completed, the recommendation report makes its way back to the Coordinator, who gives it a quality review. If it passes, the customer gets an email to check the online status of his task. That task will then have attached the analyst's recommendation report, along with any clarification notes. Copyright© 2016-2018 Bizware Online Applications, Incorporated. All rights reserved. Bizware® and eTaskBoard® are protected trademarks and registered with the U.S. Patent and Trademark Office.